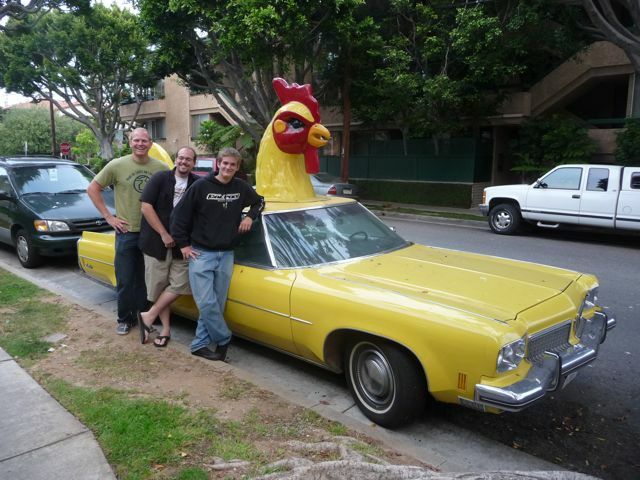 Two years ago, three students and I were coming back from an outreach in Santa Monica. Driving along California Avenue (between 17th & 18th Streets) we came across what can only be called the "rooster mobile" parked along the street. Had to stop. Even by Los Angeles standards, this is wacky. What in the world? 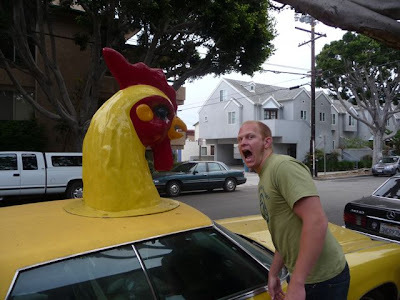 Guess Josh (student at Cal Poly, San Luis Obispo) was still hungry. This is something you expect to see at a county fair or car show. Not parked in a residential neighborhood. 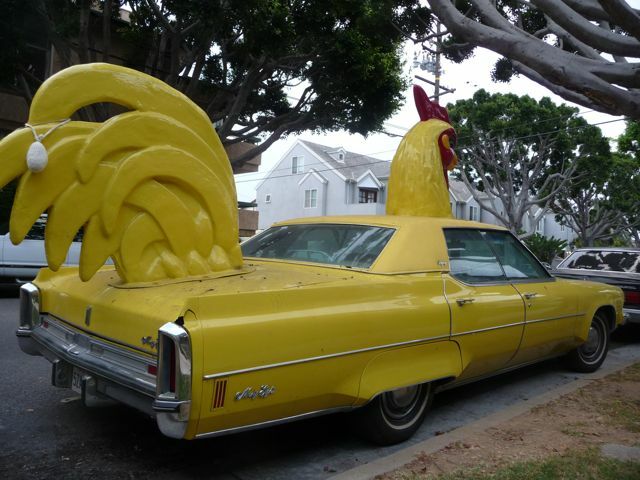 Can you imagine your neighbor parking this out front of your house? Is this even legal? I guess so. Can't believe I've never seen this before. 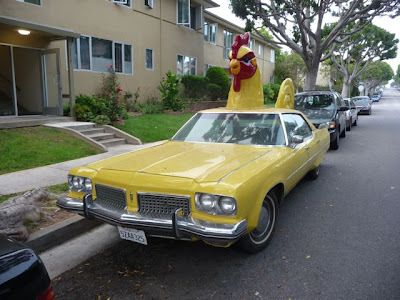 OK, I really want to know the story behind this car. Where did this amazing rooster head even come from? How did the owner attach it? What's it like driving around town? And the tail. The MASSIVE tail. How does that even affect the handling? Can you even open the truck? 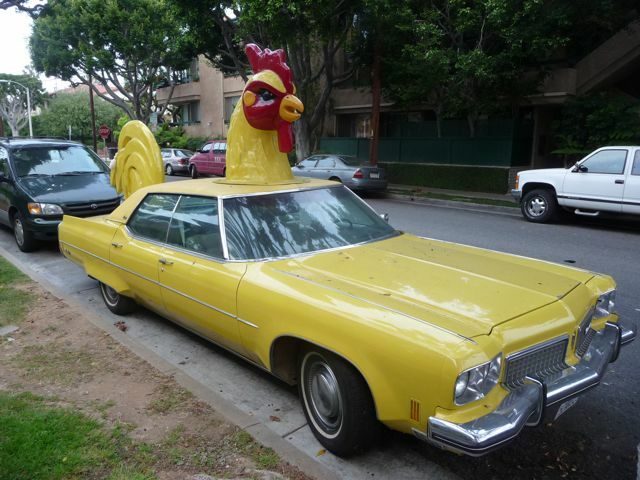 I'm curious to know the backstory on the "rooster mobile." Josh (Cal Poly, San Luis Obispo) Steve (Cal Poly, Pomona) and Matt (Cal State Fullerton) - 3 of the 70 students who invested their summer in Santa Monica on a leadership development project. Here's a link to a bit more on what that involved. That was two years ago. Josh met his fiancee that summer on the Project. My wife and I will be at their wedding later today in Santa Barbara. Pretty sweet. Congratulations to them. 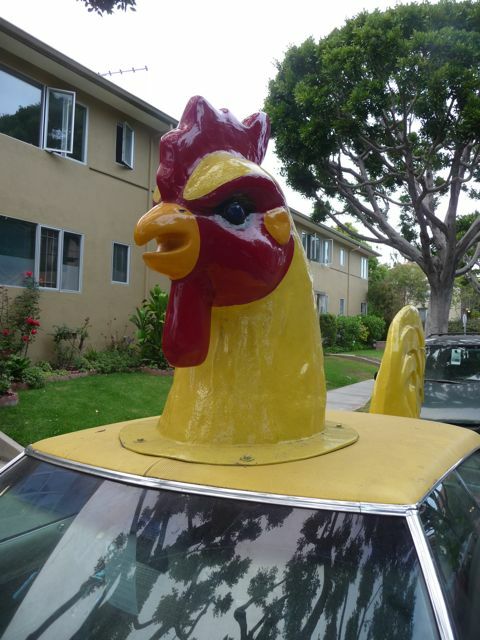 Meanwhile, is the Rooster Mobile still lurking the streets of Santa Monica? Have fun finding it - and experiencing L.A.